California's Sierra Nevada and Cascade Mountains are set to receive their first series of heavy winter storms today through Monday, and up to 3 to 5 feet of snow is expected at higher elevations. Thursday's storm begins with rain at lower elevations and heavy wet snow and strong winds reaching 100 mph at higher elevations. 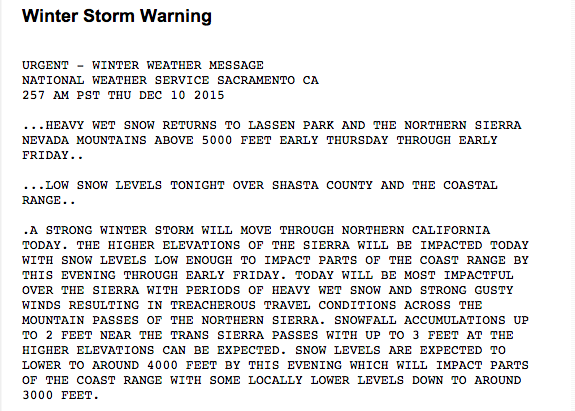 Snow levels are expected to quickly plummet Thursday afternoon and bring snow down to 4,000 feet. 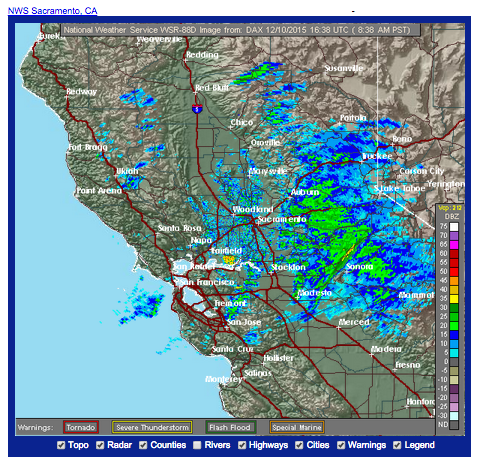 The National Weather Service in Sacramento issued a Winter Storm Warning, stating that "snowfall accumulations up to 2 feet near the trans Sierra passes with up to 3 feet at the higher elevations can be expected" from just this first storm, between Thursday and Friday morning. The weather is expected to remain cold and unsettled following Thursday's storm with snow showers Friday afternoon lasting into Saturday. The second storm hits on Sunday, following on the heels of the first. This second storm is expected to bring slightly less snowfall totals and colder air, so the snow ratios could be higher. Suffice it to say, it looks like there will be lots of fresh powder in the mountains by early next week. Be extra cautious both on the roads when driving in treacherous weather and while out on the snow when increased avalanche conditions exist.